What was the sort of "hole" man had got himself into? He had tried to set up on his own, to behave as if he belonged to himself. In other words, fallen man is not simply an imperfect creature who needs improvement: he is a rebel who must lay down his arms. Nothing is simple with God -- unfortunately, before the Fall we were made to cope with this fact, but we lost that ability to understand when we "uncreated" ourselves, so to speak. One moment, He wrenches our trust and love out of ourselves, and the next he gives us bliss, and not a moment later we are thrown against jagged brick wall, only to discover that the joy that we thought was from Him was either not from Him, or it was not truly joy. He teaches us to trust Him not always by answering our prayers, but sometimes by making our circumstances so desperate that we have no choice but to abandon our will to His; and once He finally has our love, He asks us to fling ourselves over a cliff and believe that He will catch us. Why is it that when we surrender, and say "Your Will is mine, Lord," the trials that we thought were meant only to make us say those words intensifies? C.S. Lewis has quite a lot to say on this matter. in a way that hurts abominably and does not seem to make sense. What on earth is He up to? The explanation is that He is building quite a different house from the one you thought of -- throwing out a new wing here, putting on an extra floor there, running up towers, making courtyards. You thought you were going to be made into a decent little cottage: but He is building a palace. He intends to come and live in it Himself. I believe it was St. Theresa of Avila who said something to the effect that God sends special trials to the cowardly in order that they might not only overcome our fears, but learn that God is worth more of our consideration than anything we could possibly fear. Hense, part of the intimate and mysterious connection between the trials that God sends us and true sainthood. There is a misconception in secular society -- which is so because it also exists significantly in religious society -- and that is the theory that the more we deny ourselves, the more we pray, and the more we receive the Sacraments -- in other words, the more externals we accomplish -- the greater a saint we will be (albeit the secularists equate this with superstition, and therefore reject such a spirituality). But the point is, true sainthood does not come from how often we beat ourselves, or even how often we pray or how often we receive the Sacraments, although these things, especially prayer and the Sacraments, are essential -- but an unrepentant sinner can receive the Sacraments everyday of his life; rather, it comes from the most blind trust in God's goodness, and to trust in His Will we must love Him. Granted, one of the most often repeated parables deals with this issue, so I realize that this is preaching to the choir; be that as it may, the connection between abandonment of the will and sainthood is worth repeating as it is often forgotten by everyone who is still alive (the saints themselves see the need repeat it often enough). And suddenly when this happens, self-denial, prayer, works of mercy, the Sacraments, the Eucharist, all of these things make sense, and we realize that all of these cannot be fulfilled unless we love God. The Sacraments can lead us to God, but we have them because we should love God, and because He loves us. They have unimaginable worth whether or not we receive them worthily, but the Sacraments, prayer, self-denial, all of these things are meant to be acts of love, and not just mechanical actions in and of themselves. Moreover, self-inflicted acts of piety are easy, however rigorous they might be, but are they alone sufficient in making us trust in God's goodness? One of the greatest litmus tests for answering this question is to ask ourselves how well we receive the sufferings that God gives us. This acceptance of God's suffering is what brings us back to the question of trust in God, which is intimately connected with our love of God, and which is thereby followed by the acts of love found in prayer, the Sacraments, and self-mortification. We love God because He teaches us how to love Him by making us trust Him; and from this all other acts of love follow. But What we have now in mind is our joy related to the fact that the absolute Being is infinitely perfect and that this infinitely glorious Being is a Person . . . Humility calls upon us to allow our hears to be wounded by the glory of God, to fall on our knees in loving adoration, and to deliver ourselves over to God entirely. We must display that pure response in which our center of gravity is thus transferred from ourselves to God, so that His glory taken in itself, without any reference to His benevlence, becomes for us a source of precious joy: "My God and my all," said St. Francis of Assisi. Please point out any heresy that I might be making. I was an English major, after all. This time of year is becoming stranger every time it comes around, and stranger still because it is becoming more irrelevant to me. Six years ago, I came in as a freshmen to Christendom, feeling like an adult, thinking that over the next few years, I would just add information to what I already knew about life. I knew in theory that we learn about Christ and ourselves through pure generosity of ourselves, but I had no real concept of this. In light of what I thought the future held, nothing is like I thought it would be. Adulthood is harsher than I had expected, but like Tolkein's euchatastrophe, it is not the happiest ending, but a far better one. Watching students come to Christendom as young freshmen, full of hope, anticipation, fears . . . They have no idea how much they will have changed in the next year, not to mention in the next four years. From the time I was a freshmen to the time I was a junior, and from then until now, I developed a completely different perspective on everything in life. Not only have I turned a complete 180 since that time, but I have fallen into an alternate universe. Everything changed: how I know God, what I know about myself, how I approached relationships, how I came to understand the difference between being a girl and being a women. I learned a tremendous ammount from the classes, but the most indisspensible lessons often came outside of the class room. In Return to Modesty, Wendy Shallit shamelessly exposes not only the meaning of true feminine modesty, but how the dignity of real women is what elevates boys to manhood. Alice Von Hildebrand teaches us how this dignity is sanctified and elevated by Christ in the Blessed Virgin Mary. These books speak of what I have learned in life, but what I couldn't even begin to know at 18. In Italy, I learned the beauty of physical affection and open appreciation for the beauties of life; but in regards to human behavior, I learned how to be a woman. Shallit, Hildebrand, and the authors of The Rules teach us that women are passive, allowing men to take the initiative, which in turn teaches them to be men. The Italian gentlemen stand out, but what few people notice are the women; although they are filled with the passion for life characteristic of Italians, they are not like the men in the forwardness, but rather they conduct themselves with dignity and self-control. The Italian women, and these authors, and the real women in my life, have taught me that there is strength in passivity, in restraining the temptation to take the initiative, and in allowing ourselves to be protected. When it comes down to it, the only thing better than being a grown-up is being a little kid. The only difference is that grown-ups get to drink martinis as a consolation prize. Pace e bene a tutti! I have to say, all kudos to St. Jude. I had a prayer that needed to be answered, and had needed to be answered for a long time, but I always procrastinated on praying to St. Jude, despite how desperate the situation was getting. Finally, I did it, and of course, he answered my prayer on the day that the novena ended, several days after I thought that there was no more hope. As part of the prayer, I'm supposed to spread devotion to him and distribute the novena, so here it is. Most Holy Apostle St. Jude Thaddeus, faithful servant and friend of Jesus, the name of the traitor who delivered your beloved Master into the hands of the enemies has caused you to be forgotten by many but the Church honors and invokes you universally as the patron of hopeless cases and of things despaired of. Pray for me who am so needy; make use, I implore you of that particular privilege accorded to you to bring visible and speedy help where help is almost despaired. Come to my assistance in this great need that I may receive the consolations and succor of heaven in all my necessities, tribulations and sufferings particularly (here mention your petition) . . . and that I may bless God with you and all the elect throughout eternity. I promise you O blessed Jude to be ever mindful of this great favor and I will never cease to honor you as my special and powerful patron and to do all in my power to encourage devotion to you. Amen. The more I cling to what is lost. I never knew the cost. By words that enter only dreams. And broken at the seams. As the shadows of the world close in. 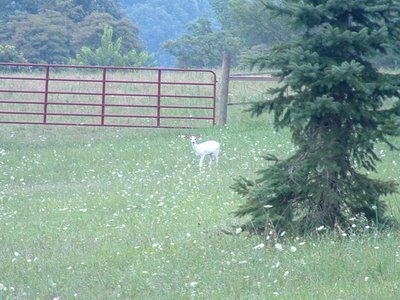 A few days ago, I was at my parents' Bentonville house, having a difference of oppinion with one of my two very stubborn horses, when I looked up and saw a mother deer, with something that I at first thought must be a little white dog following it. 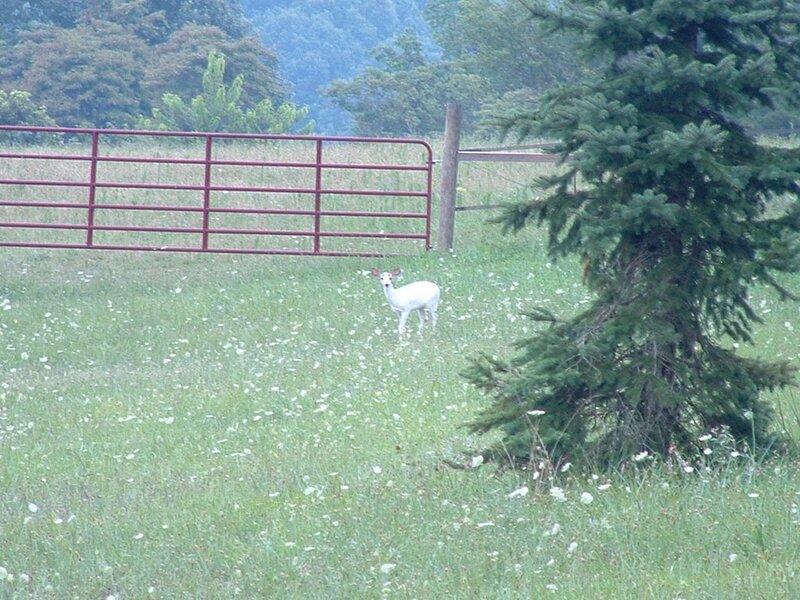 Looking carefully, however, I realized that it was far too graceful, and realized that I was looking at a young, pure snow-white deer. I think of how Peter, Susan, Edmund and Lucy followed the White Stag, and by doing so were taken back to the door of their own world. Perhaps if I can chase this young deer, the opposit will happen. Perhaps I will find my way to a door into Narnia, or some other magical place. One can only imagine . . .
'Round the hollow where courage once was laid. May you turn from haunted memories. You must challenge the fate that you have seen. As you wait for night that does not pass. You have silenced the thruth that you have found. You've lost the way, the way from here. Here's a little song I wrote a while back when I was in college. I'm usually not this depressing.